T-Mobile is introducing a retail Trade-In program aimed at giving customers a “cost-effective way to purchase a new phone and upgrade to America’s largest 4G network.” T-Mobile customers with existing handsets will be able to earn money that can be used toward the purchase of a new handset especially those running on T-Mobile’s 4G network. Customers can earn up to $300 with the trade in of their old devices, even devices that belong on the networks of other carriers. Devices must meet a set of minimum criteria including being fully functional, having an intact and working display and being free of liquid damage and corrosion. T-Mobile’s trade in program will be available at any T-mobile store in partnership with The Wireless Source, a leader in consumer electronics programs. T-mobile representatives will be able to determine the trade in value of each device and process a check for the quoted amount via a mail-in rebate process. Customers will receive a voucher, shipping label and bubble pack to ship their device to TWS and then sent a check in the amount of the quote. BELLEVUE, Wash. — May 17, 2011 — T-Mobile USA, Inc. today introduced a retail Trade-In program, aimed at giving customers a cost-effective way to purchase a new phone and upgrade to America’s Largest 4G Network. 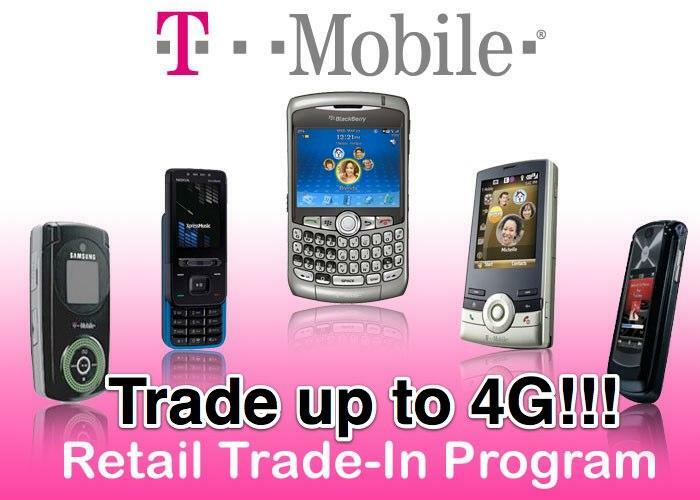 T-Mobile’s Trade-In program provides customers with the ability to trade existing mobile devices for money that could be used toward the purchase of a new handset — including any new smartphone running on T-Mobile’s 4G network. Customers have the ability to check the estimated value of their device before going to a T-Mobile retail store and learning more about the T-Mobile Trade-In program athttp://www.mytradeins.com/. The new pop-up ads are driving me to stop visiting. And they’re so funny because they will stay in the middle of the screen no matter how far, fast, or long you scroll down! Lmao! the only thing thats worth anything are the iphones. Everything else is alright, but its not a whole lot. One reason for their demise? Welcome to America and its implementation of the free market… supply and demand…where consumers have options…and the right to demand… regardless of reason. Okay so here is my situation, I have the T-Mobile G2 and was wondering can I trade it in to get the T-Mobile G2x? And in this offer do you do all of this online, or is it that you go to a retail store? Is it available in all areas? Someone, HELP! They must mean up to $300 with multiple phones, because the trade-in values aren’t much, plugged in the old phones I have lying around (all work and in good condition) – the G2 nets $70, the (original) Cliq $20, and the original Shadow $0! how did you get to check your phones? Did you have the promo code to log in? I don’t have a promo code. The Start Now button didn’t work for me at first either with Firefox 4, but when I switched to Internet Explorer, it did work by just hitting the Start Now button. You can actually get a full $300, the only phone you can get that with though is the iPhone 4G at 32GB. It also has to be damage free. Your local store should have a sheet with all the approximate tradein prices, I know we do. Thanks for alerting me to the fact that I’m better off staying on the Cliq than trying to trade it out. It’d be a great backup phone if I got another. It will be a great opportunity to get Sensation. I’ll trade in mytouch 4 along with 6 phones. CAN SOMEONE TELL ME HOW MUCH YOU GET FOR (SAMSUNG GALAXY S 4G) PLZ. I called 6 stores around town, and they all toldf me the same thing.. They are not doing this in stores, you have to go online to do it. Anyone else have similiar problems? In 2 stores I’ve had my phones appraised. One 2 weeks ago, and one 3 months ago. You don’t even get a check. You get one of those giftcards like you would through the mail in rebate. I hope I can trade in some G2s there in mint condition. I want a Sensation, well 2 of them. This has been around for awhile. Back in February I had asked them.how much I’d get for my phone. Better to sell on craigslist or ebay. Hmm, $130 for my N1. Not bad. Just go into a BestBuy or RadioShack and trade your phones in. At least a G2 goes for 150$ on credit over there. Can i trade in my Nexus One? 70bucks for my G2?! A phone that only came out less than 1yr ago?! No thanks…I’ll sell it on Ebay first! The 8gig Micro SD card that came w/my G2 is worth 1/2 that, yep I say no way…..
Lol I wonder how many new phones you’d have to trade in to get that $300. Ebay and Craigslist are your friends in situations like this. wow my dad bought my mytouch 4g for $465, and only $130 in perfect condition is this gamestop? I wonder how much they will give me for a brand new MT4G. WOW, this is worse than playground robbery. $150 for my Vibrant it seems, forget this program. As for the workaround, their sloppy developers didn’t check that their inputs were really POST, so you can GET like that. Also, they exposed the opcodes in the JS … lucky us. I believe the reason it doesn’t work for Firefox is that FF tries to be efficient about the submits and they’re not fully synchronous as a result. Since their click handler function doesn’t return false to prevent the click from propagating, this means it triggers the surrounding A tag’s HREF before the form can go off. Since they were sloppy on a third level and didn’t use a “#” for the content of the HREF, that means it forces a page refresh before the form can be processed. Awesome, no? Hopefully they’ll notice a glut of people using that link in their logs and realize they’ve got issues they need to fix. I’m afraid of what my trade in value would be for my BlackBerry Bold 9700. It’s flawless but on Craigslist, all I get are scam attempts. u need to uncheck the email box and put ur phone number. trust me after running a business on craigslist, this was the way to go. Really bad promo offer…just sayin’. Would you be complaining if I said that used HD2’s are getting well over $200 on Craigslist and ebay? They are sought after due to it’s excellent hardware and ease of wiping and running android. I sold my HD2 on ebay back in January for $200. If your goal is to get some cash with less effort, then yeah, no complaints. call it an $80 ‘convenience fee’. Also realize that some old smartphones are more ‘sought after’ than others. The HD2 can still get you some decent cash because its ‘hackability’ is so great. Not many other phones can be hacked to have Android, WP7, WinMo and Linux. 85 bucks for my Nexus One? Yea right. I can probably get like $110 off some sucker on the streets, no lie. Funny how people seem surprised not to get much for their old phones. Sell it on craigslist or ebay. And for that matter, BUY them that way too lol I got a NIB DEFY for 200 bones flat. I have a Mytouch Slide and they told me I could get $60 bucks! I was thinking why is it soo low. I know I could get at least a $100 for it on Craigs. I mostly sell my old phones there anyway, so maybe I should just stick with it. Although I will check out bestbuy to see what I could get for it. Does anyone know if they give you cash or do you have to get a phone on the spot with the credit? I just checked at BestBuy and I could get $81.00 for the Slide and Radioshack offers $55.27. I think I still get a better deal on Craigslist. Save your time and respect for yourself. Go to ebay, craiglist or somewhere else. My estimate for perfectly working slide was a whopping $60! What do they do with all these used phones? I cannot find a single store in my area that sells used phones (except for a few stands at a roadside flea market). When will there be a GameStop-type store for phones? When I say “single store” I do not mean a Tmo store. I realize they do not sell used phones. I purchased a Nokia X2 from T-mobile in September for $62.49. I have not had any luck with the phone. Sometime the phone will call the number I want and sometime it will not. It’s very frustrating. so all you have to do isgo to a retail store, give them my mytouch 4g and they’ll take off 100 dollars from htc one s? I traded in my phone on may 7th its been a month n I still havnt received my $100, how long is it supposed to take?